Sundial House Guest AccommodationSue and Andrew offer you a warm welcome to their late Victorian Guest House. To ensure your stay will be as comfortable as possible, all our rooms are centrally heated and have T.V, tea/coffee making facilities and are furnished to the highest standard. Wireless (Wi-Fi) Internet Access is available. Sundial Guest House is situated on the southern approach to the market town of Kendal (known locally as ‘The Auld Grey Town’) opposite Kendal College. The town centre is an easy 5 minute walk away and offers an extensive range of shopping, restaurants and attractions. Ground floor room available. Open Christmas and New Year. Cyclist and walker friendly. Children welcome from any age. Sundial House sometimes limits bookings to 2 or more days. 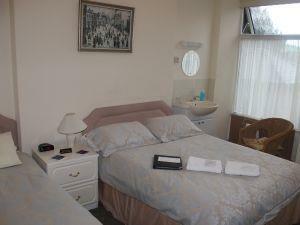 Twin-bedded room situated at the back of the house therefore very quiet. Great views from the window. Tea/coffee making facilites and colour TV. Leave M6 jct 36 and follow dual carriageway for 6 miles. After BP garage on left, exit following sign for A6 Kendal south. Follow the A6 to first set of traffic lights go through lights and indicate right. Sundial is the third house on the terrace. Nearest train station is Oxenholme, approximately 1-2 miles. we do not advertise for disabled persons. we have a ground floor room suitable for someone with limited mobility.